What's the difference between a virtual boy and a virtual tiger? A heck of a lot, according to Kinectimals dev Frontier Developments. Despite certain similarities, Frontier Developments chairman David Braben wants to make it clear that Kinectimals wasn't inspired by Lionhead's Milo, nor do the two share any technology. Braben is responding to comments made by the Phil Spencer, VP of Microsoft Game Studios, who suggested that Peter Molyneux had seeded some of the ideas from Milo to other developers in his role as European creative director. "I'd like to address some stories that are currently circulating, that Kinectimals from Frontier is somehow related to Milo and Kate from Lionhead," said Braben. 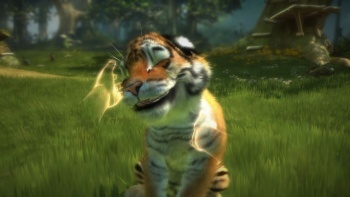 "Kinectimals has been in development since before we saw Milo. It is built using Frontier's own technology shared with other Frontier games in development, and ideas evolved from earlier games like Dog's Life. There has not been any involvement in the technology or design by Lionhead. Milo and Kate is a completely separate (and intriguing) development from Lionhead." There seems to have been a lot of crossed wires at Microsoft over the last few weeks about what is actually happening with Milo. Aside from Spencer's comments, Aaron Greenberg told Australian television at E3 that Milo was never going to be released; a statement he later clarified by saying that it wasn't going to be released this year, but was still in development. Kinectimals is due to be released at the same time as the Kinect itself in November, and Milo and Kate is due to be released at some unspecified point in the future.